A new tighter fitting cap, implemented July 15, on a failed blowout preventer of the Transocean/BP well in the Gulf of Mexico continues to keep new oil from gushing into the environment and the federal government has authorized BP to continue using the cap at least through Monday. Meanwhile the risk remains low for near-term Transocean/BP oil spill pollution threats to the Florida Keys and South Florida, according to officials involved in response efforts and, in fact, since the April 20 explosion, the Keys have not been physically impacted by the spill. "This is because the Loop Current has been cut off from the northern Gulf of Mexico and our scientists are saying there is no clear path for oil to travel from the spill site, which is about 500 miles to the northwest of Key West," according to Billy Causey, superintendent of the southeast region for the National Oceanic and Atmospheric Administration's National Marine Sanctuaries, which includes the Florida Keys National Marine Sanctuary. Translation: The only nasty oil here, is in the deep fryer at the Tiki Bar.. It has been windy and cloudy the last several days here in the islands... This has made for some tougher fishing... 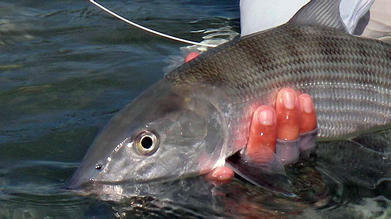 The lower Keys has lots of shore lines to fish and run that are protected from wind.. The bad news is solid cloud cover makes it tougher to spot the fish.. The good news is the wind is laying down and the clouds have thinned out.... Got sunny today!! The best news is BP has capped the oil leak... It is amazing.. since it has stopped leaking my phone has started ringing.. been booking days for later this year and next season..
Come on down... The water is fine..